We here at PI know that Monday is not necessarily your favorite day of the week and that sometimes you need a short distraction from it. So over the weekend, our staff took an internal poll to name its 3 Stars of the Penguins' first round series with the Columbus Blue Jackets. A rookie who scores 5 goals in his first ever playoff series just doesn't happen. And you could chalk up game 3 to him alone. Without him, the series is 2-2 coming back to pittsburgh and has the potential for a blood bath. Guentzel finished off the series with 5 goals and an assist, earning PI's 3rd Star for the 1st Round. When goaltender Matt Murray left the ice mere minutes before the drop of the puck in Game 1, social media went into a frenzied panic. There's no skirting around the fact that Marc-Andre Fleury has a shaky reputation when it comes to the playoffs. In this series, however, MAF stood up and got it done early. Critics of Fleury will focus squarely on Games 3 and 4 where he was less than stellar against a Jackets team that was on the ropes but, even with two stinkers, MAF put up a .933 save percentage. Debate his play and his place in the goaltenders' pecking order all you want, but on the merits of his play in Round 1 - especially in the 49 save Game 5 - MAF deserves our 2nd Star. 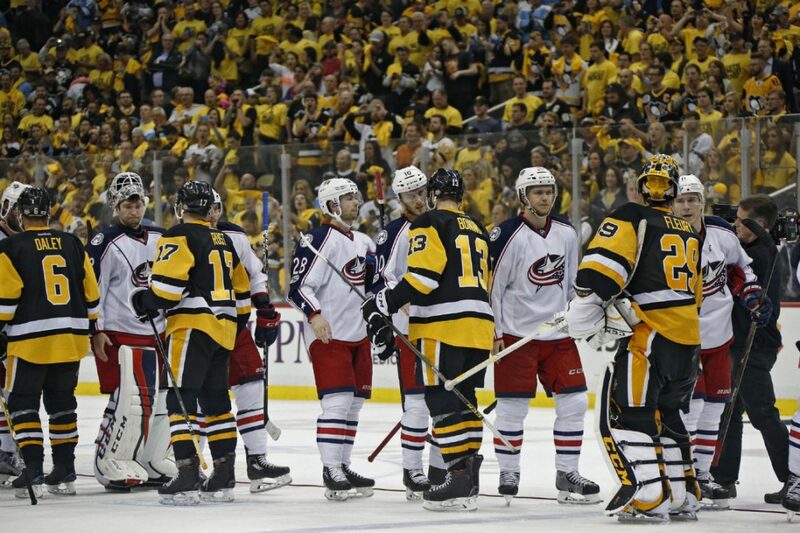 Does anybody wish to debate Evgeni Malkin's importance against the Blue Jackets in Round 1? Clearly the answer is no. Geno put up 11 points in the series (2G, 9A). More importantly, perhaps, he found a way to not only contribute offensively both in 5-on-5 and power play situations but to also stow away the version of himself that can hurt the Pens. Simply put, Malkin finished the series without taking any penalties. If Malkin plays like he did in Round 1 throughout the rest of these 2017 Stanley Cup Playoffs, whether he's collecting goals or assists, the rest of the League could be in serious trouble. Round 2 begins Thursday night in Washington. Let's Go Pens.